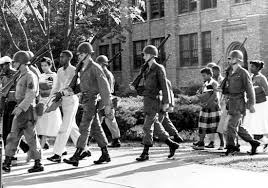 Fellowship: Jim O’Shea brought us back to 1957 in Arkansas and the Little Rock Nine integration attempt that was made possible only after President Eisenhower sent troops to enforce the desegregation order. Jay Ginsburg with Ed Isenburg – Matthew’s son. Jim thanked Barry for an outstanding job as chair of the Celebrate Cultural Diversity Committee. Please contact Mary Richardson or Kevin Wickless if you have a guest speaker to suggest. They are still looking for a wing walker. The Rotary/ Liberty Bank Thanksgiving Drive starts Tuesday, October 9th and runs through November 17th - The bank will match $.25 for every dollar donated. Rodney experienced three amazing coincidences regarding friends – all within one hour. Larry gave for the Browns’ 625 days. Jim welcomed guests and mentioned that his father was a Dolphins fan. Mike Goldblatt said that while he has cut back on his hours at work, he is as busy as ever. His annual Hershey PA car swap meet, at which he is a vendor, will be held in October. Paul Blanchard invited everyone to attend Polish Fest 2018 on October 21st from 2-6 pm on Franklin Street. Manny had a Cuban cigar that would be auctioned off later in the meeting. Bill Champagne stressed the importance of preserving the historic burial grounds with regard to the proposed Burger King, which would abut the burial ground property. Bill recalled wonderful presentations given by Matt Isenburg in the past. Matt Cooney gave for his popcorn order form, which he brought with him to the meeting today. Mike Gordon welcomed Ed Isenburg in spite of the fact that he doesn’t sell Fords anymore, but has moved on to selling Jeeps. Gary sold his house in Vermont after 30 years. He regretted not buying trip insurance for his 32nd trip to Myrtle Beach. John Mancini and his wife visited their son who completed basic training at Fort Benning. They drove there in order to be able to avoid Hurricane Florence. Apparently, John’s wife has somewhat of a lead foot and they were stopped by a motorcycle cop for speeding in Chattanooga, Tennessee. The officer approached John in the passenger seat and wrote up just a warning, which John thought was because the officer had sympathy for him in that situation. Pres. Jim auctioned Manny’s Cuban cigar and won it himself for $5. Jim told a story about how to get Dunkin’ donuts for free. Pres. Jim was told by someone in the Public Works Department that the trolley needs some work done on it before the city will take ownership. Barry reminded us that the Club did turn the trolley over to the city during a ceremony three years ago. Manny will contact another club to see if we can join them on an international project. Pres. Jim closed our meeting with an inspirational quote.